In this guide, we’ve given you a rundown on 11 of the best tools to use to stress test your CPU, RAM, and GPU. If you’ve just built your computer, overclocked any of your components, or you are having problems with an aging system, stress testing your PC will give you a good idea of whether or not your computer is stable and, if it isn’t, where the problem might be coming from. So, in this guide, we’re going to give you our choice for the 11 best tools to use to stress test your system’s components, including the best CPU stress tests, the best RAM stress tests, and the best GPU stress tests. We’ve also included a number of hardware monitoring tools that you can use to monitor how your system is behaving during the stress tests as well. 5. Which Stress Test Tool Should You Use? While running stress tests on your system, it’s a good idea to monitor your system’s temperature and load levels. The following tools can be used in unison with the benchmarks listed below in order to give you more information while you benchmark your computer. Core Temp is a nice lightweight CPU monitoring tool that will provide you with real-time temperature readings and load percentages on your processor. If you have an Intel processor, Core Temp will also provide readings for the temperature and load on each individual core on your CPU. However, for AMD temperatures it just shows a single temperature for the entire CPU. Core Temp also provides you with some basic info on your processor and tells you the voltage and frequency your CPU is running at as well. And, there are a few different handy plugins available for Core Temp that expand its capabilities. GPU-Z is similar to Core Temp, except that instead of monitoring your CPU, GPU-Z will, obviously, monitor your GPU. With GPU-Z you can monitor the temperatures and load on your GPU, as well as your GPU’s clock speed, onboard memory clock speed, fan speed, and the amount of memory being used among other things. MSI Afterburner is another graphics card hardware monitoring tool. However, it dubs itself as being a graphics card ‘utility tool’ because of all of the other features it comes with. Along with being able to provide you with much of the same information that GPU-Z offers you, MSI Afterburner will also let you overclock your GPU, set custom fan profiles, run in-game benchmarks, and even record gameplay video or take in-game screenshots. HWiNFO64 is one of the more advanced hardware monitoring tools out there as it allows you to monitor multiple core components in your system. With HWiNFO64 you can track temperatures and other information on your CPU, GPU, RAM, and motherboard, as well as track fan speeds, component loads, and plenty more. If you’re looking to stress test your CPU, whether to check how stable your processor is running after overclocking it or to check and see if there is a cooling issue on your CPU, the tools listed below will help you get the information you need. Prime95 was developed by GIMPS, a computing project aimed at finding new Mersenne prime numbers (any prime number that can be the result of the equation: 2n − 1). However, while Prime95 was originally intended to find Mersenne prime numbers, the torture test that is included in the program (which helps ensure correct operation when searching for Mersenne prime numbers) has been adopted by many hardware enthusiasts to help them stress test their processor (and memory)—especially after overclocking their CPU and memory. Aida64 is another CPU stress test tool that a lot of users prefer over Prime95. Whereas Prime95’s torture test can push your processor to operate in an unrealistic manner, Aida64 takes a more practical approach by mimicking real-world processes that place a 100% load on your processor to test how it will hold up. The only problem with Aida64 is that it isn’t free. For a basic license (that can be used on up to 3 computers), Aida64 costs $34.99 which, while not expensive, is probably not an ideal option for the majority of users who will only use the stress test a handful of times. There is a 30-day free trial, though, so if you only need to use it right now then you won’t have to pay for it. 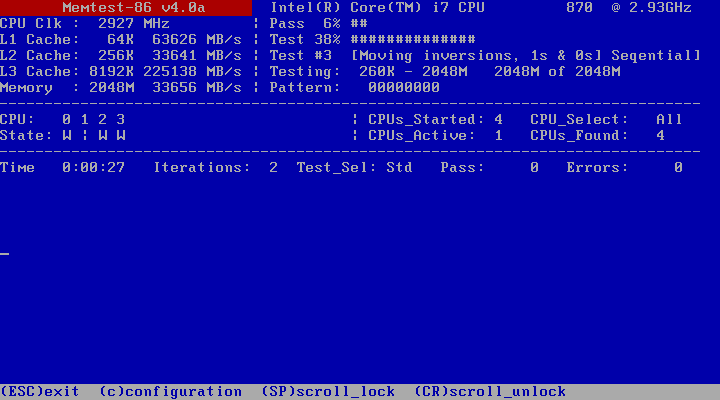 IntelBurn Test is another CPU stress testing tool that will help you push your CPU to the max in order to determine if it is stable. Like Prime95, IntelBurn Test also gets some flack for pushing the processor further than necessary. And, many feel that IntelBurn Test puts even more unnecessary stress on your processor than Prime95 does. For those of you that are looking to stress test your system’s memory, either to diagnose any issues that may be going on with your RAM or to check for stability after overclocking, the tools listed below will work for you. PassMark Software’s MemTest86 will test your system’s memory to try and uncover any problems. There is also MemTest86+, which was an offshoot of MemTest86, but is no longer considered to be a viable option due to the fact that it hasn’t been updated since 2013—whereas the original MemTest86 continues to get updated. We’ve discussed Prime95 as a popular CPU stress test tool, but its ‘Blend’ mode torture test also serves as a great RAM stress test as well. Unlike MemTest86, though, Prime95’s ‘Blend’ mode doesn’t check your RAM for errors. So, if you’re looking for a stress test tool that can also diagnose any issues your memory may be having, the MemTest86 is a better option. If you’re overclocking your RAM, though, and you want to check for stability, Prime95’s Blend test is a good option to use. For GPU stress testing, the benchmarks listed below will give you a variety of options that will push your GPU to the max. Uningine’s Heaven & Valley benchmark tests are some of the more popular options to stress test your graphics card, either after overclocking it and testing for stability, or just as a synthetic benchmark to see how your graphics card performs. Unigine’s newer Superposition benchmark is worth considering as well, especially if you’re looking for a GPU benchmark that has VR features included in it. 3DMark is another commonly used GPU stress testing tool that can be used on a variety of devices (PCs, laptops, phones, tablets, etc.). 3DMark also monitors the clock speed, framerate, load, and temperatures during each benchmark as well. There is a basic edition of 3DMark that is free to use, but the full version will run you ~$30 on Steam. FurMark is another common GPU stress test option that is worth noting. However, FurMark doesn’t get a lot of love among hardware enthusiasts as it has been known to put an unrealistic amount of stress on your graphics card. FurMark can be used for short periods of times, but probably isn’t the best overall option for stress testing your graphics card. Which Stress Test Tool Should You Use? While all of the stress test tools mentioned above can work for you, the reality is that your best bet for stress testing your system is to use multiple stress tests tools. If you’re looking for the most information possible, running multiple stress tests will give you the best idea of how the components in your system will hold up in extreme real-world scenarios. I currently use Prime95 for RAM and CPU testing, but I need to find something that can stress test 2 GPU at the same time if possible.